The newly updated 2013 BMW 7 Series will again set new benchmarks in its class for performance, luxury, efficiency and safety. The updates include significant powertrain upgrades for 740i/Li and 750i/Li models – including BMW’s 8-speed Steptronic automatic transmission, xDrive – BMW’s intelligent all-wheel drive system – now available for the 740Li, as well as a completely new powertrain for the ActiveHybrid 7. 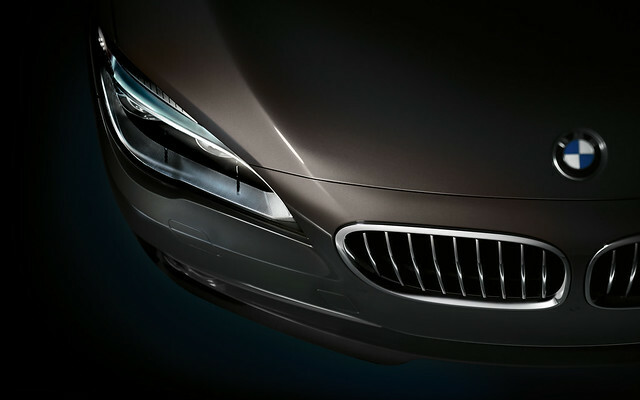 The new 7 Series boasts a revised exterior that features new technologies such as available LED headlights. The interior of the new 7 is similarly enhanced with a newly redesigned iDrive system and the availability of an optional Bang & Olufsen High-End Surround Sound system. The new 2013 7 Series arrives in US BMW center showrooms in late summer 2012, expect for the ActiveHybrid 7 which arrives in early fall. While the 760Li, with its 6.0-liter Twin Turbo V12, remains the pinnacle in the BMW 7 Series line, both inline-6 cylinder 740i/Li and V8-powered 750i/Li models receive significant enhancements, designed to deliver both better performance and greater efficiency. Every 7 Series model now features an intelligent 8-speed Steptronic automatic transmission that offers significantly reduced fuel consumption and emissions. Auto Start-Stop, Brake Energy Regeneration and the second-generation Driving Dynamics Control with ECO PRO mode offer additional potential for fuel-saving. The sunstantially revised ActiveHybrid 7 sets new standards for efficiency while still delivering on the promise of The Ultimate Driving Machine. 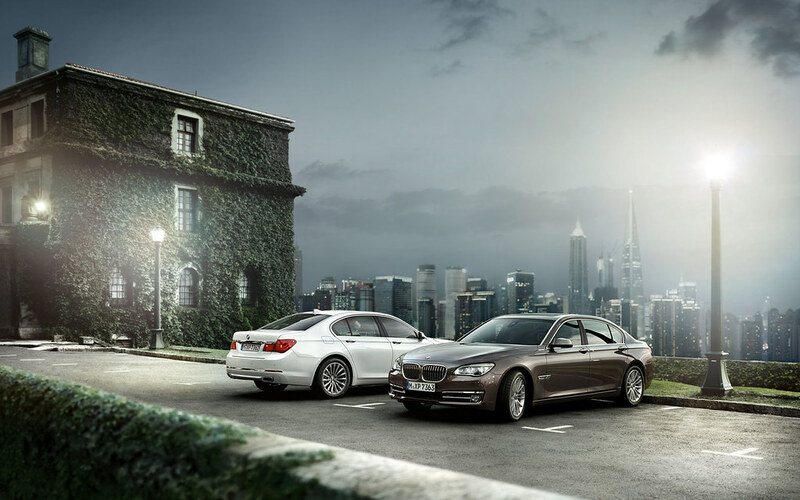 The 2013 BMW 740i/Li now feature BMW’s latest 3.0-liter TwinPower Turbo inline 6-cylinder (N55). Compared to the previous model, this new engine combines a single twin-scroll turbocharger, High-Precision Direct Injection and Valvetronic, BMW’s ground-breaking throttle- less intake system. This engine again uses Double-Vanos infinitely variable camshaft timing. The 740i/Li use a high-output version of this engine delivering 315 horsepower and 330 lb-ft of torque for power on par with the previous model. The engine is mated to BMW’s 8-speed Steptronic automatic transmission. The performance of the previous model is maintained while efficiency is significantly improved. US EPA mileage estimates are not yet available. However, in the EU test cycle, fuel consumption was reduced by about 20 percent. Another significant option for customers in the US is the availability of xDrive, BMW’s intelligent all-wheel drive system, for the 2013 BMW 740Li. 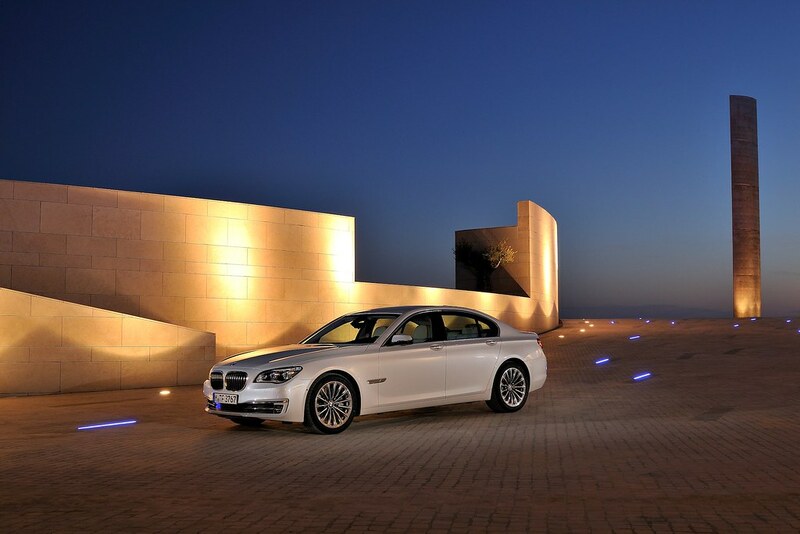 The 2013 BMW 750i/Li also receive upgrades to their powertrain that enhance performance while improving efficiency. The 4.4-liter TwinPower Turbo V8 has been updated with Valvetronic, BMW’s throttle-less intake system. It works in concert with High-Precision Direct Injection and twin turbochargers, nestled on top of the engine, to deliver 445 horsepower, a 45 hp increase over its predecessor, and 480 lb-ft of torque, an increase of 30 lb-ft. This newly updated engine is mated to BMW’s 8-speed Steptronic automatic. Together, this combination yields even greater performance with a 0-60 time of 4.7 seconds (preliminary), while consuming significantly less fuel. US EPA mileage estimates are not yet available. However, in the EU test cycle, fuel consumption was reduced by an impressive 25 percent. Both 740i/Li and 750i/Li models benefit from BMW’s Auto Start/Stop System which shuts off the engine when stopped at traffic lights or in stop-and-go traffic to further maximize fuel savings. As BMW continues the development of intelligent hybrid drive systems, the second generation of the BMW ActiveHybrid 7 is set to take a significant step forward for the 2013 model year. The updated model sets itself apart with lower fuel consumption and emissions, as well as innovative auxiliary functions. This latest evolutionary step uses BMW’s 3.0-liter TwinPower Turbo inline 6-cylinder engine. In this application it is the same 315 hp version as in the new BMW 740Li and replaces the V8 engine previously used in the ActiveHybrid 7. Other hybrid components include a 55 hp synchronous electric motor, hybrid-spec 8-speed Steptronic automatic transmission, a lithium ion high-performance battery and power electronics which run the intelligent energy management. The various components create a powerful and harmonious whole, giving the new BMW ActiveHybrid 7 an outstanding balance between performance and efficiency. With combined output of 349 horsepower and peak torque of 367 lb-ft, the new BMW ActiveHybrid 7 accelerates from 0 to 60 mph in about 5.5 seconds (preliminary). At the same time, it delivers significantly improved fuel efficiency. US EPA numbers are not yet available. However, in the EU test cycle the new ActiveHybrid 7 yields efficiency gains of 14 percent over the new 740Li which itself sees an impressive improvement over its predecessor. A host of innovative features enhance the car’s dynamics and ensure optimum efficiency of the hybrid drive system. For example, the electric motor provides an extra 155 lb-ft of torque through the boost function if the driver should need a quick sprint or to call on strong mid- range acceleration, when passing or merging for example. ECO PRO mode, with coasting function and proactive analysis, prepares the drive system in advance for upcoming situations on the road. Brake Energy Regeneration and the Hybrid Start-Stop system also work together to maximize overall efficiency. The 2013 BMW ActiveHybrid 7 can also run purely on electric power. If the hybrid battery has sufficient charge and the driver goes easy on the accelerator, the car can cover a distance of up to 2.5 miles almost silently and without producing any tailpipe emissions. The top speed on electric power alone is 37 mph. The new ActiveHybrid 7 will be available in the US as a long- wheelbase model only. Auto Start-Stop, Brake Energy Regeneration, ECO PRO mode. All new BMW 7 Series models come equipped with Auto Start-Stop which can cut fuel consumption by up to six percent as well as Brake Energy Regeneration. Generally the battery is only recharged when the driver is off the throttle, for example, when coasting or under braking. Driving Dynamics Control in the new 7 now includes ECO PRO mode which modifies the powertrain management as well as the programming of the heating and air conditioning, heated seats and exterior mirror heating to operate with optimum efficiency. It also offers tips for an efficient driving style. Taken together, ECO PRO can reduce fuel consumption by as much as 20 percent. The new BMW 7 Series not only sets a new dynamic benchmark for luxury cars, it also raises the bar in its class when it comes to ride comfort. The driver can alter the overall character of the new 7 towards sportiness or comfort using Driving Dynamics Control with ECO PRO mode. 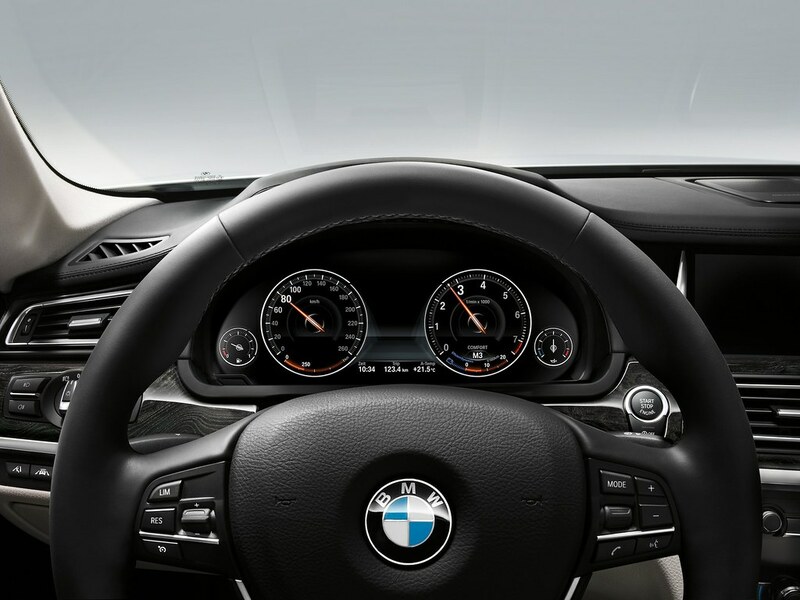 Driving Dynamics Control with ECO PRO mode is standard for 740i/Li and 750i/Li models. Driving Dynamics Control allows the driver to tailor accelerator response characteristics, engine response, power steering characteristics, and the Dynamic Stability Control thresholds. The Servotronic function, Integral Active Steering, automatic transmission and Dynamic Damper Control are also integrated into the system. Using the rocker switch on the center console, drivers can choose between ECO PRO, COMFORT+, COMFORT, SPORT and SPORT+ modes. Each mode activates different settings for the relevant powertrain and chassis components. The distinction between each of the modes is even more perceptible than before. The addition of ECO PRO mode helps the BMW 7 Series driver maintain an efficient driving style. It does so by changing the accelerator mapping so that the same pedal travel delivers less power than in the standard mode. The control strategy for the automatic transmission is also modified to upshift sooner and downshift later, while intelligent energy and climate management reduces power consumption as well as the energy consumption of electrical systems such as heated mirrors and seats. The biggest factor influencing fuel consumption, as always, is the driver’s own personal driving habits. In order to facilitate the most efficient driving possible, ECO PRO provides tips and incentives on how to develop a more efficient driving style for the situation at hand. Special displays in the instrument cluster let the driver know how well they are doing by indicating how much the driving range is being extended and by showing a history of their fuel consumption. In ECO PRO mode, average fuel consumption can be reduced by up to 20 percent. New: coasting mode, proactive driving assistant and advance preparation of hybrid drive system. The ECO PRO mode in the new BMW 7 Series includes the new coasting mode, which is designed to decouple the engine when coasting at speeds between 30 – 100 mph. In coasting mode, the engine in the new 7 Series freewheels on deceleration with no engine braking effect thereby reducing fuel consumption. Through proactive driving, the kinetic energy built up by the vehicle can be harnessed to achieve fuel savings of as much as five percent. The coasting function is shown graphically in the information display and can be switched off if desired. The BMW ActiveHybrid 7 features a coasting mode which completely shuts off the combustion engine when coasting, allowing the ActiveHybrid 7 to glide along emissions-free. Intelligent energy management allows the ActiveHybrid 7 to analyze the driving situation ahead in order to prime the hybrid drive components for maximum efficiency. This is accomplished by integrating the power electronics with the navigation system. Based on data, such as route topography, speed limits or traffic levels, the vehicle can be prepared in advance and the available energy deployed as efficiently as possible. For instance, a longer downhill stretch can be used to recharge the hybrid battery so that the ActiveHybrid 7 can be driven on purely electric power through a residential area on the “home stretch”. In addition to the new Driver Dynamics Control with ECO PRO mode, the new BMW 7 Series comes with Dynamic Damper Control. When equipped, it works in concert with. The 7 Series is the world’s first car to feature an electronically controlled damping system whose shock absorbers are adjusted individually at each wheel based on the condition of the road surface and the driving style. Each wheel’s compression and rebound settings are adjusted continuously and independently from one another. For example, a stiff chassis setting can be combined with comfortable responses to unevenness in the road surface. The shock absorber settings can be preset by the driver using the Driving Dynamics Control switch. Active Roll Stabilization, which standard on the 760Li and optional on other models, reduces body roll in high-speed corners and under sudden changes in direction. Sensors calculate the amount of body roll which is quickly counteracted by rotary actuators in the front and rear anti- roll bars. This system allows drivers to thread the car through corners with even greater agility and precision. Integral Active Steering provides maximum agility and comfort. Integral Active Steering is available for rear-wheel drive BMW 7 Series models, which combines the Active Steering system for the front wheels with rear wheel steering. The steering angle and power assistance are controlled at both the front and the rear with the help of electric motors. The optimized system control unit processes information on wheel rotation speeds, steering wheel movement, yaw rate and lateral acceleration to ensure optimum steering behavior for the driving situation at hand. Integral Active Steering also works with a variable steering ratio on the front wheels, which makes parking and maneuvering easier and enables impressive precision at higher speeds. Dynamics made even more comfortable: double-wishbone front suspension and integral-V rear suspension with self-leveling air suspension. The front suspension of the BMW 7 Series is based on the familiar aluminum double-wishbone construction which combines maximum rigidity and minimum weight. The patent-protected integral-V rear suspension of the BMW 7 Series is also made from aluminum. Modified ball joints, firmer shock absorbers, new rubber bearings and carefully tuned elastokinematics have enabled the engineers to minimize vibrations and improve ride comfort. All BMW 7 Series models are now equipped with self-leveling rear air suspension, which keeps the car riding at a constant height no matter what kind of driving conditions it encounters and regardless of the loads on board. This automatic self-leveling suspension responds to any change in load by adjusting the suspension at the relevant wheel. This means that only small interventions are required in response to spring movements caused by road imperfections and cornering lean. This feature was previously available only on long wheelbase models in the US. The BMW 7 Series has traditionally set the highest standards for aesthetic appeal and innovative technology. In the luxury sedan segment it represents the epitome of athletic elegance and sporty driving dynamics. The new BMW 7 Series reaffirms its stylish presence and sporting prowess through expressive new design features at the front and rear. From the front, the long, broad hood of the BMW 7 Series gives it an elegant profile. The contour lines of the hood draw the eye to the upright new BMW kidney grille as they extend forward. The grille’s chrome surround is now larger, a change which – together with a new kidney grille design that includes nine slats in place of the previous 12 – gives it greater prominence and reinforces the car’s presence on the road. A large, full-width air intake dominates the lower section of the revised front apron. It is now split into three sections, a pair of chrome bars marking its outer sections and adding further depth to the car’s sporty looks. Included is BMW’s innovative “air curtain” technology, which lowers fuel consumption at higher speeds by forcing the air to flow more aerodynamically around the front wheels. 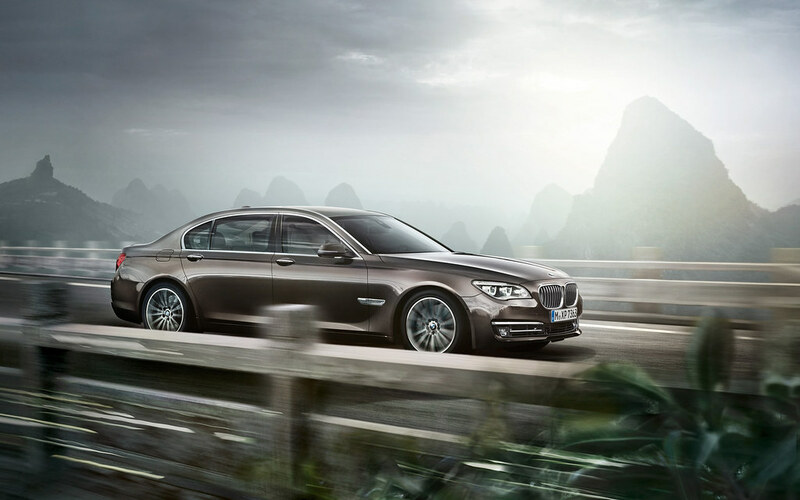 Hallmark BMW proportions, such as a long wheelbase, short front overhang, long, sweeping hood and set-back passenger compartment with a coupelike roofline, define the sporting and elegant silhouette of the BMW 7 Series. 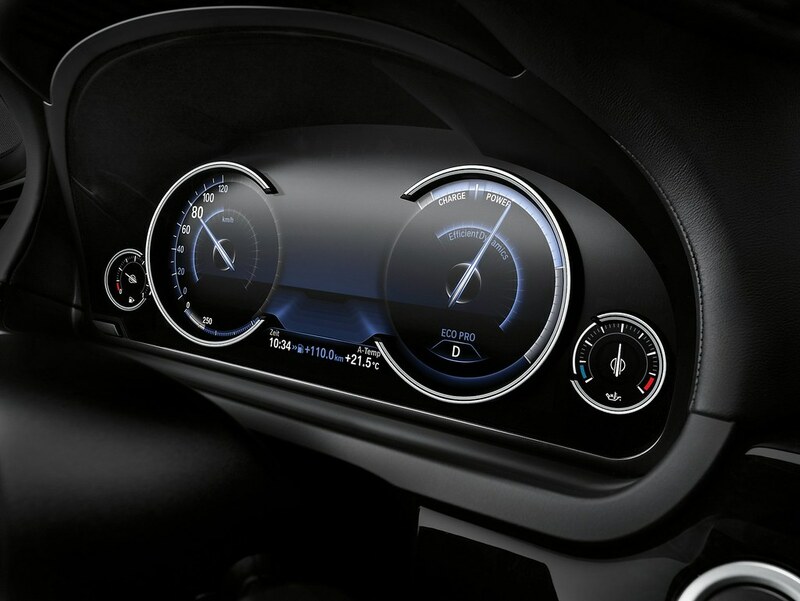 The exteriors mirrors have been redesigned and now feature integrated directional indicators. The powerful rear of the BMW 7 Series reflects its performance potential. The horizontal lines and subdivision of the rear into several levels visually lowers the height of the car. The design of BMW’s traditional L-shaped taillights, linked by an eye-catching chrome strip, remains unchanged. They are now richer in contrast thanks to differing shades of red. A second, delicately sculpted chrome strip draws a visual connection between the two slim reflectors in the rear apron. Another slim chrome bar between the four chromed tailpipe tips in the rear apron is a distinguishing feature of the V12 760Li flagship. High-visibility innovation: Adaptive LED Headlights. The new BMW 740i/Li and 750i/Li are equipped with standard Adaptive Xenon headlights. Adaptive LED Headlights, which are optional on those models and standard on the 760Li provide a fresh take on this established feature. In both cases, the Corona light rings for the parking lights and daytime running lights also featuring LEDs. The result is a stunning, distinctively BMW showcase for the innovative light technology. In addition, they also generate the low beam and high beam light from the two light rings. The result is the brand’s hallmark twin round headlight look being expressed even more strikingly – not only with the daytime running lights switched on, but also when the headlights are activated in the dark. The Adaptive LED Headlights are, however, about more than just looking good; they also ensure the driver has optimum visibility. Their bright white light provides a bright and even illumination of the road ahead. From a color perspective, the light comes much closer to natural daylight than that created by conventional halogen or xenon headlights, lending even reflective objects far greater contrast. The cornering element of the Adaptive LED Headlights is also tailored to the car’s speed, steering angle and yaw rate, allowing the pivot of the headlights to adapt automatically to the line of the corner. Meanwhile, a light source positioned specially in the headlight housing generates the cornering light which, at low speeds, ensures illumination of the road surface in the direction the car is turning. LED technology is also deployed for the turn signal indicators, each of which consists of eight LED units arranged in a row underneath the light rings. As well as enhancing visibility in the dark, the Adaptive LED Headlights also significantly improve the signaling effect of the car’s lights. Interior design combines a driver-focused cockpit with a first-class cabin. 7 Series. A traditional feature of BMW interiors is the driver-oriented ergonomics. In the new 7, this includes newly designed, more slender front seats offering the best possible ergonomics, optimum lateral support and long-distance comfort. Dakota leather and Nappa leather can now be ordered in Ivory White or Veneto Beige upholstery. Multifunction seats are also available in place of the standard seats. The new BMW 7 Series offers individual rear comfort seats as standard equipment on the 760Li and optional on other models. They can be adjusted to suit individual requirements. The backrest angle and seat position can both be varied, as can the position of the head restraints. 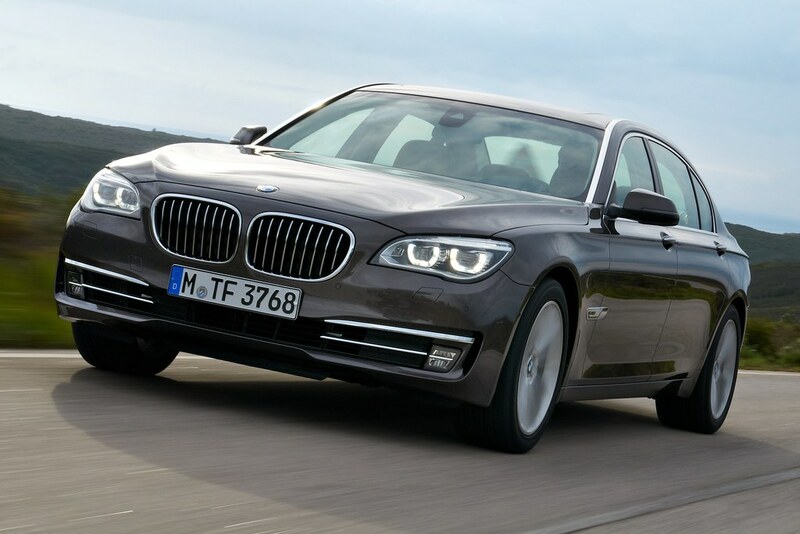 The long-wheelbase 7 Series provides the ideal platform for long-distance comfort. All of the 5.5 inches added to the wheelbase of the standard-length 7 Series is used to create a first- class environment for the rear passengers. Changes to the roofline of long-wheelbase models create nearly half an inch of extra headroom in the rear. The optional Rear Seat Entertainment Package now includes an iDrive controller and two 9.2- inch screens which, instead of being integrated into the front seats, appear to be “floating” on them. Their exclusive design takes its inspiration from the latest breed of flatscreen monitors, which gives them an extremely slight and lightweight look. 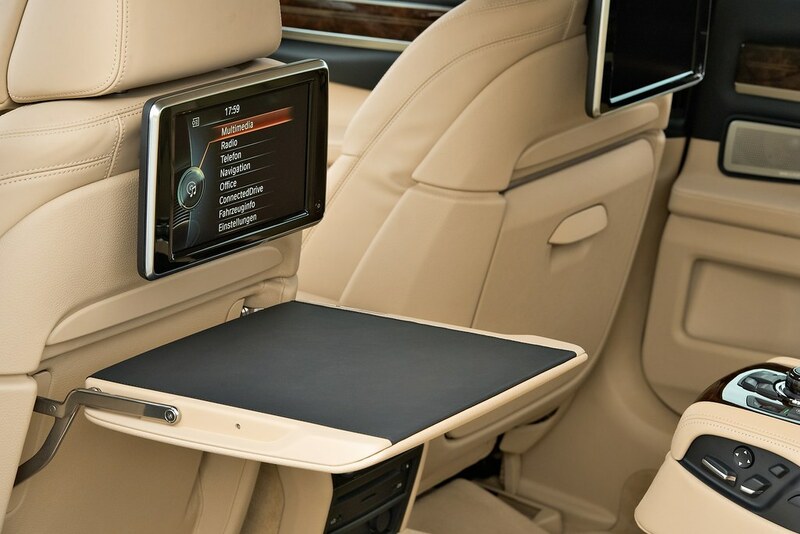 Enhanced interior soundproofing takes the BMW 7 Series another step towards perfection. Additional insulation materials in the B and C-pillars, skirts and trunk area team up with revised seals around the window frames and exterior mirrors to minimize ambient noise. New ambient lighting for the interior creates a pleasant ambience, especially at night. It includes footwell lights for the driver and front passenger and indirect roof liner illumination via lights integrated into the B-pillars. The color of the ambient light can be altered according to taste. New Bang & Olufsen Surround Sound System: A new level of listening pleasure for the dedicated audiophile. When it comes to delivering audio pleasure of the highest order, the Bang & Olufsen High-End Surround Sound System designed especially for the new BMW 7 Series hits all the right notes. Jointly developed by the Danish audio specialists and BMW, this system produces an exceptionally natural sound from 16 speakers distributed around the cabin. It is a fully active system featuring digital signal processing, which means the two bass speakers, seven mid- range speakers and seven tweeters all have individual amplifiers. This technology enables the targeted modification of any sound reflections inside the vehicle. The Bang & Olufsen High-End Surround Sound System uses Dirac DimensionsTM technology to recreate the acoustics of a reference listening room in the passenger compartment. All vehicle occupants therefore enjoy the same high-quality sound stage wherever they are sitting. The electrical signals are converted into precisely defined sound waves using neodymium magnet drivers, and the mid-range speakers feature extremely stiff Hexacone diaphragms. The outstanding quality of the Bang & Olufsen High-End Surround Sound System is underlined by exclusive design features. The form and color of the advanced all-aluminum speaker grilles have been tailored precisely to the interior design of the new 7 Series. The special perforation pattern of the grilles is created using a very sophisticated drilling technique. The grille mounts are not visible from the outside, ensuring that the grilles stand out from their surroundings by appearing to float in a slightly raised position above the surface. This exclusive ambience is further enhanced by a discreet lighting effect, which showcases the contours of the sound sources with a subtly impressive effect. The B&O Acoustic Lens Technology element in the center of the instrument panel area adds both a visual feature and is an acoustic innovation. As soon as the audio system is activated, the central element containing the integrated mid-range speaker pops up, prompting the tweeter lens to be extended at the same time. The tweeter lens distributes its signals evenly at 180 degrees throughout the interior. This extraordinarily harmonious horizontal dispersion of sound is achieved through the special design of the lens, which also minimizes unwanted vertical sound dispersion. New-generation navigation system: display and control in the third dimension. The latest-generation navigation system features a revised design and honed operating system. The menu-driven navigation system has been augmented by new functions. The user interface includes revised graphics and now comprises 3D elements, while the entire architecture of the individual menus is now presented in virtual, three dimensional spaces. Its 1.3 GHz processor and dedicated 3D graphics card, bring new levels of animation and dynamic transitions. Along with the menu presentation, the navigation displays have been revised and enhanced. The map displays and guidance information are now depicted with even greater brilliance and sharpness than before. Additional function bars allow the map view to be customized quickly and simply without having to leave the map. The new function bars are superimposed as an extension of the original map bar and open up additional options. This allows for Real Time Traffic Information (RTTI) or weather updates to be superimposed, points-of-interest to be displayed, or the map to be quickly switched from top view to perspective view. Standardization of the control bars in the multimedia sphere facilitates operation of a wide range of audio sources. The Pie menu: greater operating convenience at a click. The interactive map view also comes with the option of selecting special functions directly from the map. Using the iDrive Controller, the driver can mark a spot in the interactive map to open the Pie menu. This radial menu offers quick and easy access to a host of options. Depending on the information stored, the driver can have points-of-interest in the area flagged, read up on any stored details, start navigation to any of the points-of-interest, alter the map view and have the current location or destination displayed. If further information on a point-of-interest – such as the telephone number – is also stored, the driver can instantly access it and make a call. Split-screen display with more detailed guidance views. The split screen in the central information display also adds new functions. While entering the destination by selecting the state, city and road, the chosen location is also displayed in the map view on the split screen. The zoom function can be used to verify whether the destination shown in the relevant section of the map is the intended one. For the navigation process itself, the familiar arrow guidance in the split screen has now been joined by a high-level guidance feature. This is automatically activated when the driver reaches a certain point ahead of the next navigation instruction. From a specified distance, which varies according to the category of road, the arrow display turns into a schematic, perspective view of the surroundings. This gives the driver even better orientation thanks to an enhanced depiction of the location and precise lane guidance. For an optimal picture, the perspective view changes in stages to a top view of the junction or intersection as the vehicle approaches it, while a dynamic vehicle indicator pinpoints the car’s current position. The new 3D city model offers another view of select cities to aid navigation. If the 3D representation is available, a highly realistic depiction of the surrounding streets and buildings makes it easier for the driver to find their way around. The mobile office: dictation function, voice memos and voice control. The latest-generation navigation system features a full speech recognition function and optimized voice control system to complete the portfolio of office functions offered by BMW ConnectedDrive as BMW. The full speech recognition system now includes the dictation function which gives drivers the opportunity to dictate text freely and compose short text- based messages simply by saying what they wish to write. Just a few seconds after dictation has been completed, the transcribed text appears in the display and can be read out if desired. Drivers also have a number of simple-to-use, speech-based editing tools available to them for putting the final touches to e-mails and SMS messages easily and, most importantly, safely. The multilingual system can recognize six languages including English and Spanish. An additional speech-based option to enhance office functionality is voice memos which can be sent directly by email. The advantage to the driver is the ability to quickly store ideas or to- do items and send them to the relevant addressee(s) – without being distracted. The recorded memos can be stored on a USB stick for use outside the car. The navigation system now allows additional menu functions to be called up through simplified voice commands. The system is able to recognize contact data irrespective of the format in which it is stored, and thus independently of first name and surname order. Additional submenu functions can now be activated or actions specified by speech input – from adjusting the radio and entering a destination to changing the route criteria. Voice control is becoming even easier to use. Rounding off the new office functions is the enhanced facility for simultaneously pairing two phones to the car at the same time. The contact data of both phones are now transferred to a shared list which is then available for making phone calls and sending emails. High- performance hardware means that calendar and contact information is displayed without delay, ensuring that both telephones are quickly ready for wide-ranging use in the vehicle. Enhanced Active Cruise Control brakes to a halt if required. Enhanced Active Cruise Control builds on the current Active Cruise Control with Stop & Go. The full-range radar sensors are now supplemented by a front-mounted camera on the rear- view mirror providing a more in-depth read on traffic conditions. When driving in heavy-flowing traffic or traffic jams, the driver is able to safely move along with the flow and let the vehicle’s automatic systems handle the tasks of stopping and pulling away again as well as approaching junctions where there are already vehicles waiting ahead. Combining radar and video data improves detection of other vehicles and speeds the system’s reaction time. If a vehicle ahead brakes very sharply in free-flowing traffic, requiring action, the driver is prompted to do so by a two-stage warning. Simultaneously, the activation thresholds of the Brake Assist system are lowered, activating the brake priming function in the process. If the driver fails to react to the warning, Enhanced Active Cruise Control will intervene to decelerate the vehicle, even braking it to a stop as needed, depending on the situation. Active Protection monitors the driver’s behavior at the wheel. The BMW 7 Series now boasts an even more extensive Active Protection safety package thanks to the addition of the Attention Assistant. The system’s electronics analyze driving behavior on the basis of various signals such as steering angle, road speed and other engine parameters. If the system increasingly detects telltale signs of fatigue starting to build up, the central Control Display encourages the driver to take a break by displaying a coffee cup symbol. At the start of every journey when the driver and front passenger fasten their seat belts, the Active Protection motorized belt retractors reduce any belt slack. If the car enters a critical pre- crash scenario, the driver and front passenger belts are pulled tight, and the side windows and sunroof are closed. Active Protection deduces that a collision is likely based on data from the front-mounted camera or radar, an emergency braking maneuver by the driver, or the onset of heavy understeer or oversteer. If a crash is unavoidable, the system will automatically brake the car afterwards without any intervention required from the driver. Following the initial impact, the car is slowed to a standstill with a maximum deceleration rate of 5 m/s2 and its brakes are then locked for a further 1.5 seconds. This reduces the likelihood of – or even prevents – a secondary collision. BMW Parking Assistant takes charge of maneuvering into parking spaces. The available BMW Parking Assistant uses ultrasonic sensors integrated into the sides of the vehicle to help search for suitable parking spots. The system then helps the driver to maneuver safely and comfortably into parallel parking spaces. With the Parking Assistant activated and the car travelling at a slow speed of no more than 22 mph, a notification appears in the Control Display to alert the driver to suitable spaces that are around 4 feet longer than the BMW 7 Series as it passes them. During the parking process, all the driver has to do is change gears, operate the accelerator and brake, and keep an eye on the area around the car. The Parking Assistant then takes care of all the steering movements required to execute a precise reverse parking maneuver. A new bird’s-eye view of the vehicle in the Control Display works in unison with the Park Distance Control to clearly visualize the distance to other objects and make it easier for the driver to monitor the parking process. Hands-free trunk opening makes access a little easier. 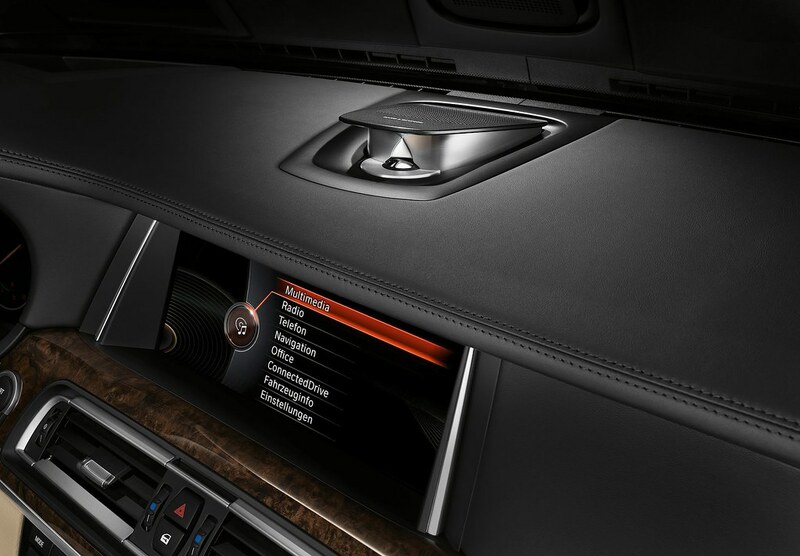 The BMW 7 Series now offers even easier access to the trunk with hands-free trunk opening. Standing behind the car, a quick movement of the foot under the center of the rear bumper is enough to open the trunk. The trunk then automatically unlocks and swings open. In order for the system to work, the key must be present. Yet more un-rivalled driver assistance systems and mobility services. 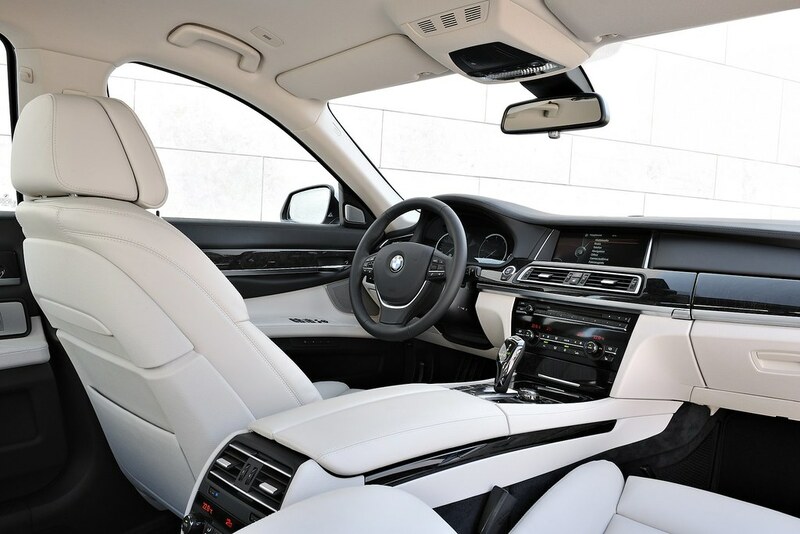 In addition to the highlights detailed above, BMW ConnectedDrive in the new BMW 7 Series encompasses additional features and technologies designed for the utmost in convenience and safety. These include the existing full-color BMW Head-Up Display, BMW Assist with enhanced Automatic Collision Notification with automatic vehicle location, rear view camera and Surround View, Real Time Traffic Information (RTTI), as well as the full range of infotainment features offered by BMW office functions for Blackberries and BMW Apps, the industry’s most advanced iPhone integration. As has been the case with every generation of BMW 7 Series, the new 2013 model brings with it a host of innovations and enhancements all designed to ensure that, the BMW 7 Series will continue to set the standard for performance, efficiency, luxury and safety.